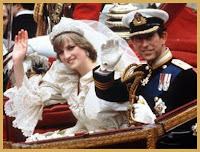 How could we mark Royal Wedding day without remembering the wedding of Prince William's parents, Charles and Diana? But who could help but get sucked in by Diana -- her beauty, her shyness, her insistence on standing in line (sorry, "queueing") with her sons in McDonald's, her fight to raise them as normally as possible and so they understood the world around them more than their father did? She made some hella stupid mistakes (hello, so did Charles), but overall, the world was a better place with her in it. Her death in 1997 seemed so needless, so premature, so senseless. Damn paparazzi. Damn drunken drivers. Damn princesses who think they don't need to wear seatbelts. Congrats, William, and may your own marriage be as joyous as we had hoped your mother's would be. Are you watching Wills and Kate? What are your memories of Diana and Charles' big day, or Andrew and Fergie's? Oddly, I don't remember the actual wedding ceremony (I was in high school, and on summer vacation wild horses couldn't have gotten me out of bed that early to do anything), but I distinctly remember the hype. My mother was very excited about it, and I think she did watch it live. Remember, this was in the days before Tivo, streaming video, 24-hour cable news, entertainment channels like E! and VCRs, so if you didn't watch it live and were that interested in it, you really missed out. I watched Diana's wedding (we were the same age) and Fergies too (my dress was also more like hers) and William and Kate's this morning. I'm happy to see that their story seems like it will have a much happier outcome than poor Diana's did, mostly due to the fact that she was an incredible woman and a warm and loving mother who did a remarkable job of raising her boys amid all the craziness going on in her too short life. I wish she could have had the happiness that she deserved, and could have been with them on this very special day. I think she would have loved it, and Kate too.